The Chandler Engineering Model 5265MG measures the onset of gel strength as well as the continued development of the gel strength. A precision motor coupled with a reaction force transducer allows the instrument to measure the phase changes. The motor is capable of extremely accurate step motion down to 0.2 degrees per minute while measuring gel strength and up to 150 RPM while conditioning the slurry. The motor is coupled to the driven paddle using a magnetically coupled shaft keeping the motor and measurement electronics outside of the high pressure/high temperature environment within the cylinder. The torque transducer performs measurement throughout a broad range of force from 10 lbf/100 ft² up to 1500 lbf/100 ft². 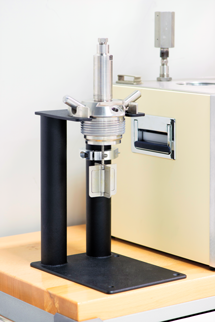 The cylinder is designed for insertion into an existing Chandler Engineering Model 4265 UCA or Model 5265 SGSA, making use of existing instrumentation. The Model 5265MG provides versatile and adaptable technology. The measurement principle includes a motor Start/Stop method for Gel Strength determination. As an added function, the motor may be run at a continuous rate if desired by the operator. The geometry of the paddle is industry specific or may be adapted to other geometries as needed. Operating temperatures up to 400ºF (204ºC) and operating pressures up to 20,000 psi (138 MPa) provide full well bore simulation. Pressure control accuracy ±500 psi of F.S.